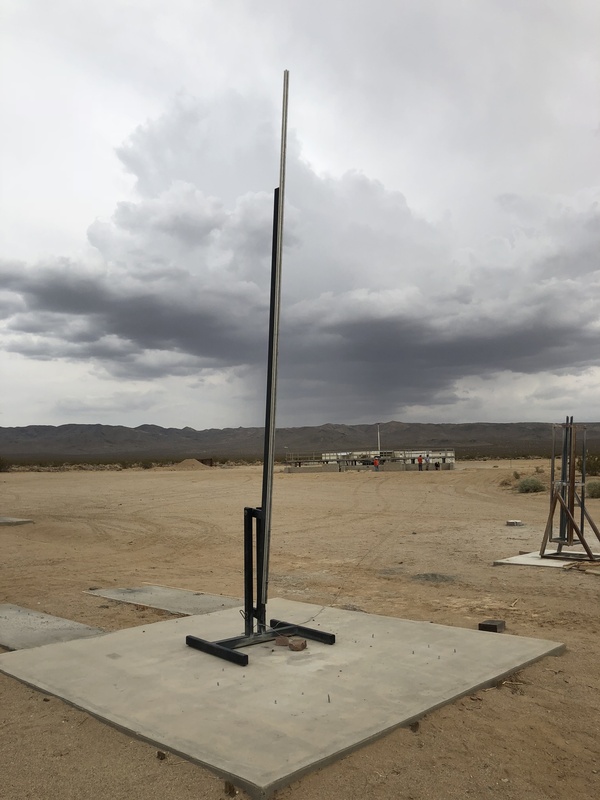 The Reaction Research Society (RRS) held a launch event at our private Mojave Test Area (MTA) on Saturday, July 21, 2018. As I came into the site in the morning, I snapped a picture our front gate and the rough location which will be the site of our new sign to arrive very soon. Follow that car. Turn left to go to the RRS. Jim Gross was our pyro-op for the event. Many of us arrived early so Jim and the rest of the RRS had time to review the projects we wanted to hot-fire and fly if possible that day. Also, it was new members’, Michael Lunny and Bill Behenna’s first trip to the MTA. I think there is no better way to sell our membership on the benefits of the RRS than your first trip to the MTA. It worked for me! We were glad to host another group of students from the Watts area schools with the support of the Los Angeles Police Department’s (LAPD) Community Safety Partnership (CSP). This has become known as the “Rockets in the Projects” program. It was a challenge to hold this event in July in the Mojave desert, but the kids and staff seemed to withstand the 100-degree heat quite well with lots of water and bringing ice. We gave our safety briefing to everyone and explained the do’s and don’t’s for the event. 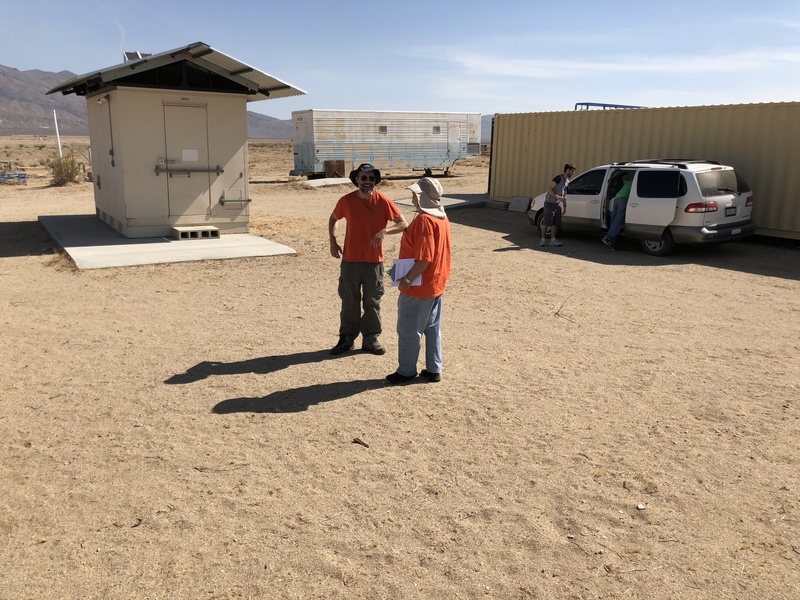 RRS member, Matt Tarditti, was there helping with getting people shuttled around to the places necessary including moving our pyro-op, Jim, and his apprentice, (me) Dave Nordling, back and forth between the bunker and the alpha launch rails. Every step adds up in the heat and it’s wise to work as efficiently as you can. The heat ultimately got to me and I had to take a pause into the air conditioning of my truck. Despite my best efforts in hydration, the Mojave summer was still overwhelming. It is a feeling that many RRS members know all too well at some point in their time with the society at the MTA. Matt was kind of enough to continue to assist Jim to complete the launch series with the alphas. 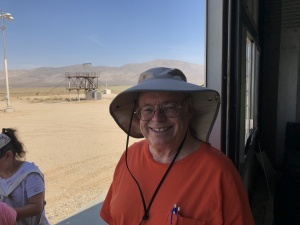 Even, Jim Gross, who has been a resident of the high desert for many years, was having a tough time in the high temperatures and very low winds of that day. We had extremely low winds which made for great rocket launching weather, however with the building clouds above holding in a lot of the heat of the day, it was a real challenge for everyone to fight the stifling heat. 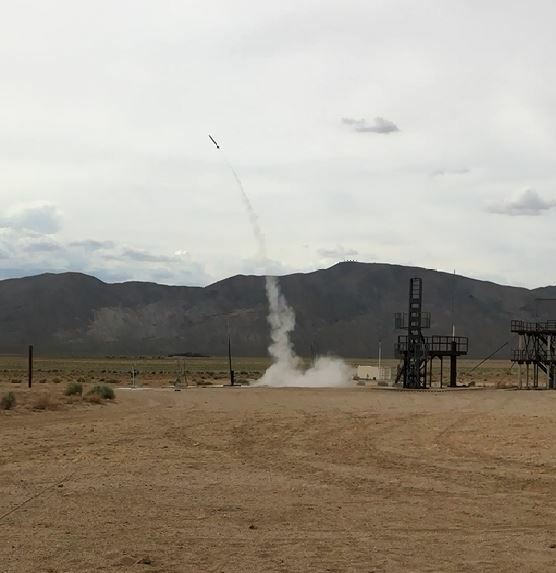 The RRS conducts launch and test events at the MTA year-round, but some months are harder than others. The LAPD CSP team does a great job in preparing these kids in the weeks ahead before this event. 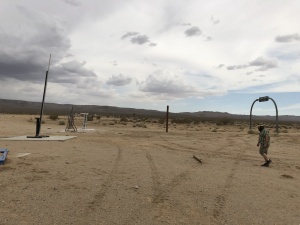 Often, this is many of the kids’ first trip into the Mojave desert. The stark beauty of the landscape hides the subtle dangers of snakes, spiders and the ever-present risk of heat stroke (even at 10:00 AM!). The RRS educational program is both fun and informative and through preparation everyone can make things safe. 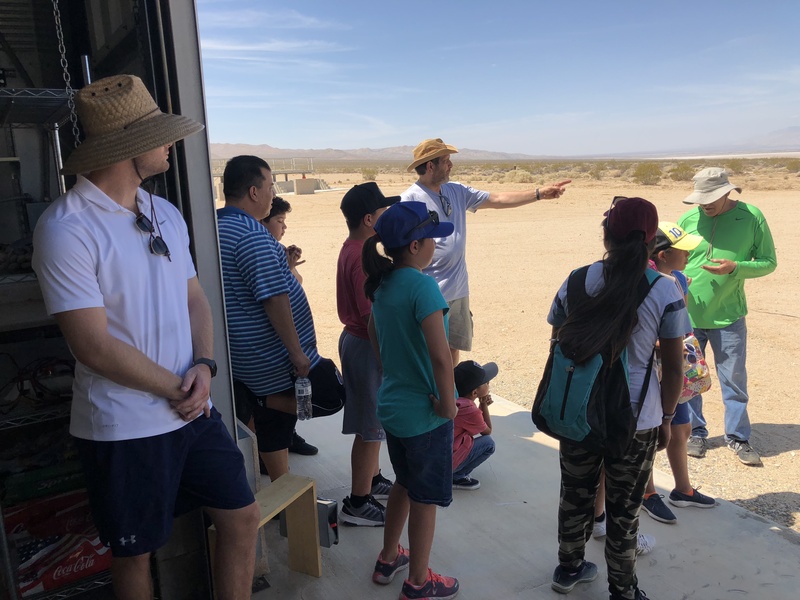 The kids were quite ready for the final event in the RRS educational program which is seeing their painted and assembled RRS standard alpha rockets take flight. 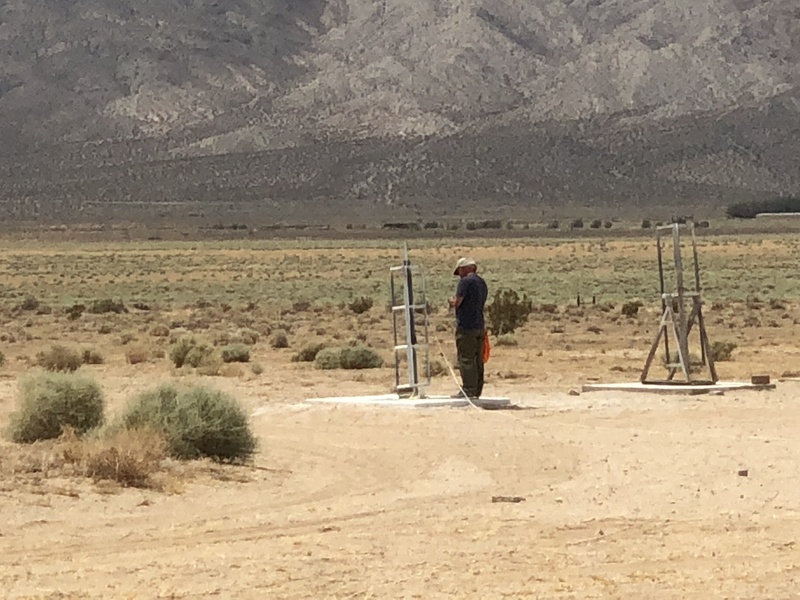 Our first goal of the event was to get the students’ rockets in the air so that those less experienced in the desert heat can go on home once the last one was complete. We had seven standard alphas to be launched, all painted by the students as their way to personalize their team’s flight. As always, the RRS reminds our classes that painting the bodies is nice, but since they return to the ground without a parachute, painting the fins in a bright and observable color matters the most when trying to find them on the desert floor. You’ll only have the tail fins sticking out of the ground when you find your rocket. The kids paid careful attention to the time of flight which gives some data as to how well packed the alphas were. Two stopwatch measurements were made on each of the seven alpha flights. Impact was not heard on the seventh flight, so no data was taken. The results are somewhat consistent between the two readings and ranged between 36 and 39 seconds. Ideal time of flight for an RRS standard alpha is thought to be between 35 and 42 seconds. 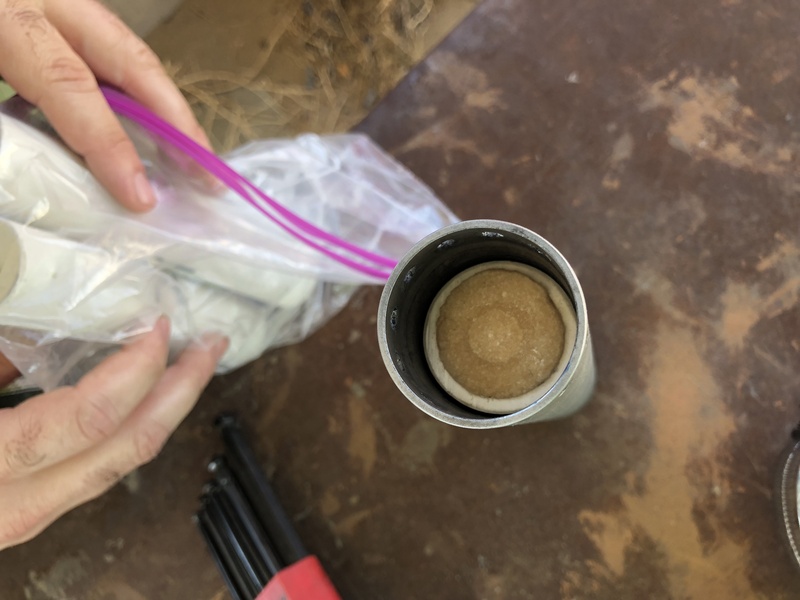 This would indicate that Osvaldo’s rapid micrograin loading system is doing well to properly pack the propellant leading to good results. 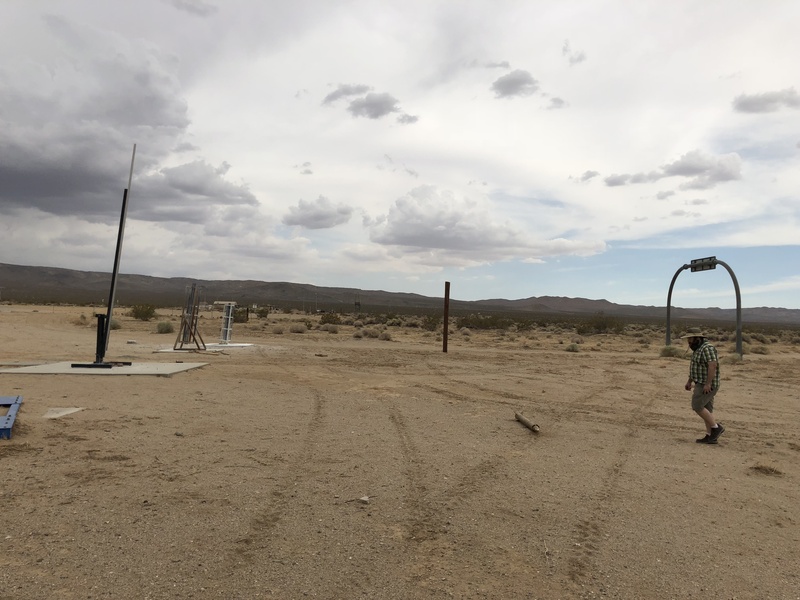 After the sequential launch of all seven alphas, it was unanimously decided not to let the kids hunt for their rockets downrange. The LAPD CSP team and the Watts kids went home after taking a picture under our arched sign. 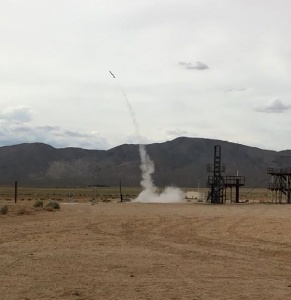 RRS member, Michael Lunny, shot a great video of one of the alpha launches from the bunker. I hope to get it posted to the RRS YouTube channel. 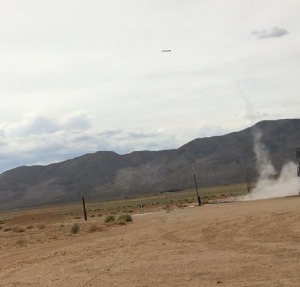 We have a few micrograin rocket flights on YouTube, but we hope to add more content there soon. You’ll notice our name is not fully spelled out due to the old character limit when the account was made. After the Rockets in the Projects, this left the rest of the RRS membership to attempt the other projects we had ready for this launch day. 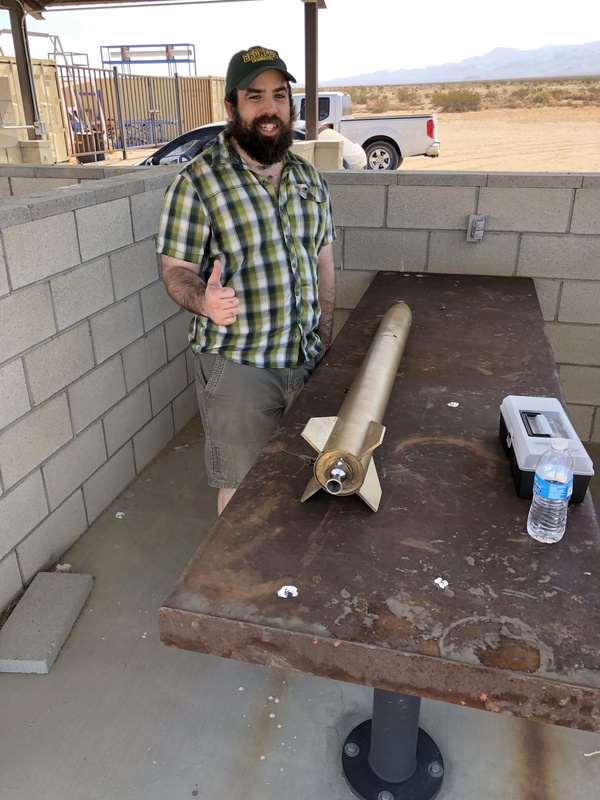 Richard Garcia brought his home-built rocket that is adapted for the sugar-KNO3 motor he tested at the 2018-06-02 event. He made three motors, one as a simple end-burner, the other two were cored. The plan was to fire conduct a static firing or two with his test motors and if all looked good fly the third motor in the rocket from the RRS rail launcher. 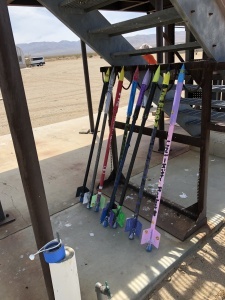 “Rocket candy” as it is also called in amateur rocketry has been getting more popular at the RRS. 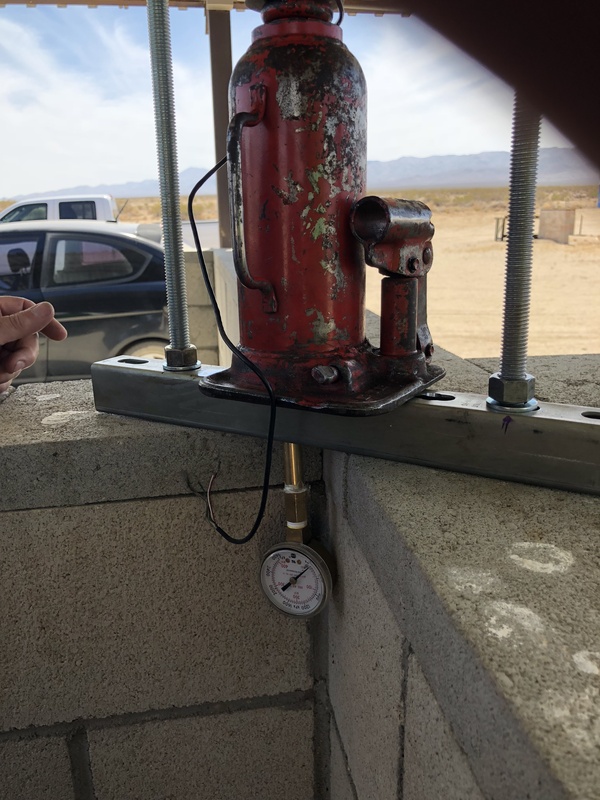 Richard brought back his vertical static fire stand that bolts to the larger RRS frame. Although his thrust stand is not outfitted with a load cell (yet), it does give him the opportunity to safely secure his test motors and visually compare the results and time the burns. Larry Hoffing made a parachute system in his RRS standard alpha. His system was a little different from Osvaldo’s as he required a second firing line to light a delayed fuse for the parachute deployment system he put in. His son, Max, was there to help get things ready for flight as we included Larry and Osvaldo’s alphas into the launch sequence. Larry’s goal was to explore an older method of timing the deployment of his parachute by use of cannon fuse. Also, Larry had attached a signalling whistle on one of the fins. 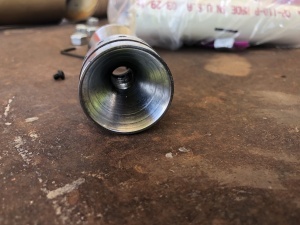 The ancient Chinese used to mount whistles on their rockets of war to strike fear in the hearts of their enemies as the rockets would scream to their target. 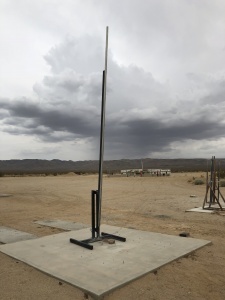 It was Larry’s intent to add the element of sound not only for an impressive screeching launch off the rails, but also for better tracking of the rocket’s final descent to the ground. 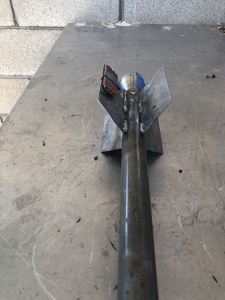 Although having a single whistle mounted to just one fin will impart a spin to the alpha, the flight will still be stable as proven on similar alpha flights. In the recent past, we have had success flying a larger, single keychain camera on the outside of a single fin while maintaining good flight stability despite the nauseating rapid spin seen in the footage from these externally mounted cameras. Unfortunately, Larry’s alpha had a problem at launch with the failure to light the micrograin rocket. Also, with this delay it was apparent that the parachute payload deployed way too early. 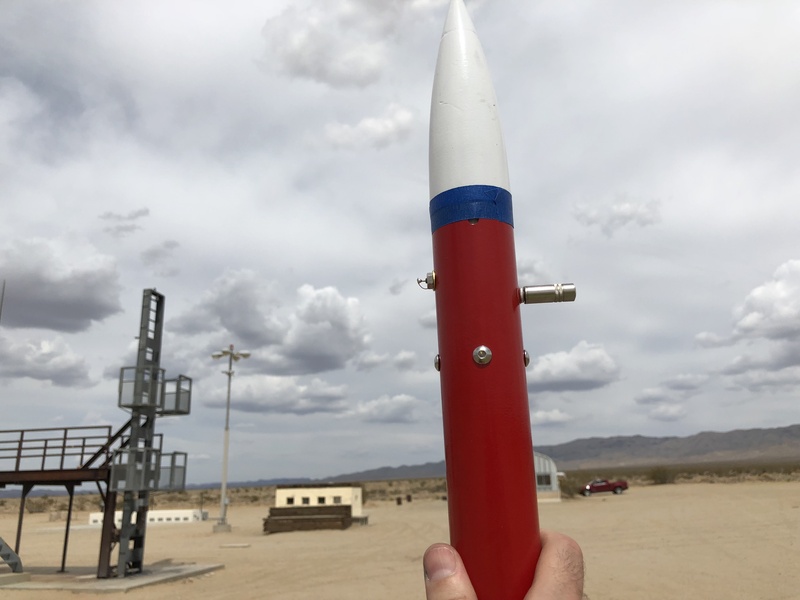 The goal was to fire at 20 seconds in the flight and the fuse seemed to go at only 2 seconds popping the payload tube while the rocket stayed on the alpha rack. The two systems had to fire at nearly the same time but one system failed entirely and other went off too early. 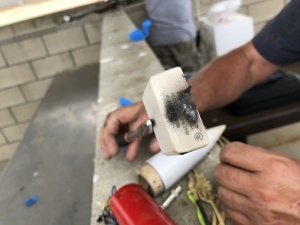 After exploring all other failure modes with the firing circuit and procedures, it was confirmed that it was a bad electric match with a break in the wire. This was the first time I’ve seen an electric match fail in the three years I’ve been with the RRS, but it has been known to happen. 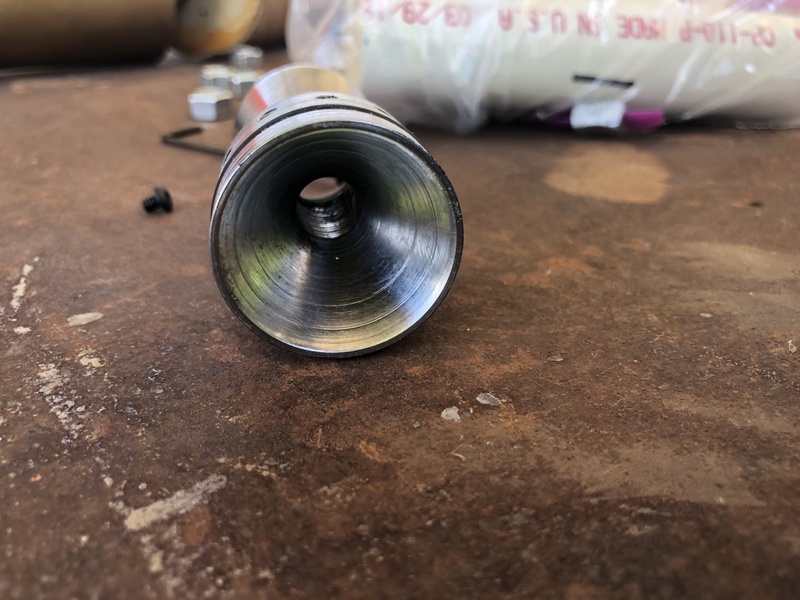 With Larry’s whole payload system requiring repackaging, it was decided for expediency, just to remove Larry’s rocket from the launch rails, remove the nozzle and dump the micrograin propellant for a safe disposal burn on the ground. Larry will be able to re-use his alpha hardware, but it will have to wait for next launch. Next was Osvaldo’s red colored alpha with his alpha with a parachute system built in it. Osvaldo made some minor improvements to the circuitry and this was to be his second flight. He also had a commercial telemetry package within his payload section. 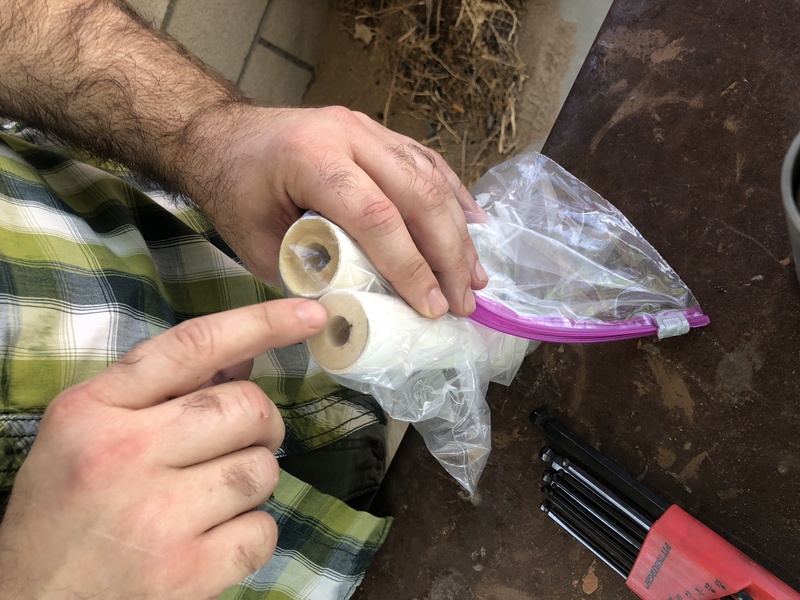 The first flight of his original parachute design for the alpha on 2018-06-02 was a complete success. 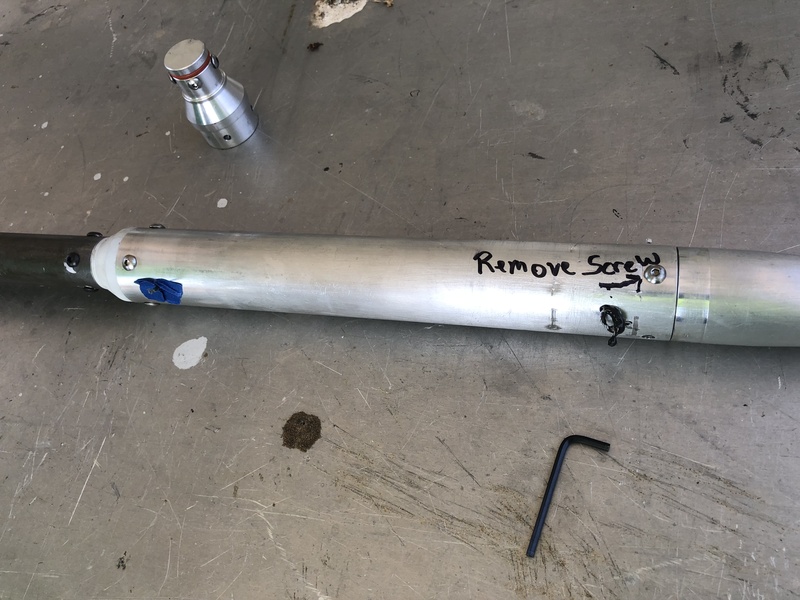 Despite some slight overheating of the parachute from the black powder deployment charge on the initial flight, the rocket still coasted down very gently such that it laid neatly on the ground and a shovel wasn’t necessary for recovery. 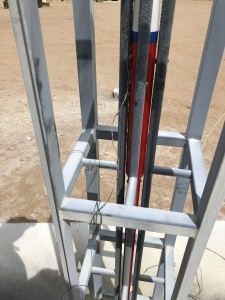 The flight of Osvaldo’s second alpha was similarly successful in that the break-wire system and deployment mechanism operated properly, but the parachute itself failed to unfold due to tangling. The rocket’s descent even with the folded parachute was able to be spotted and Osvaldo recovered all pieces of his second flight. Also, as an added bonus, Osvaldo was able to fit a commercial telemetry package to measure the flight acceleration. 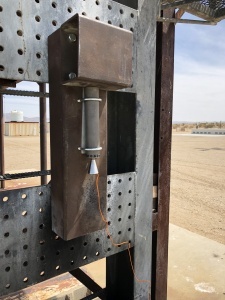 As the whole package survived in tact, it will be very interesting what the device was able to measure from within the tight confines of alpha payload tube near the nose. I hope he can present his results from the flight at the next meeting. There has been a lot of great progress in parachutes for the RRS standard alpha recently. Both Larry and Osvaldo have made great progress. With the persistent efforts of our RRS membership, I think its reasonable to expect that we could offer a standard alpha parachute package for our future events once we demonstrate a series of successful flights, settle on the design and figure the added cost. 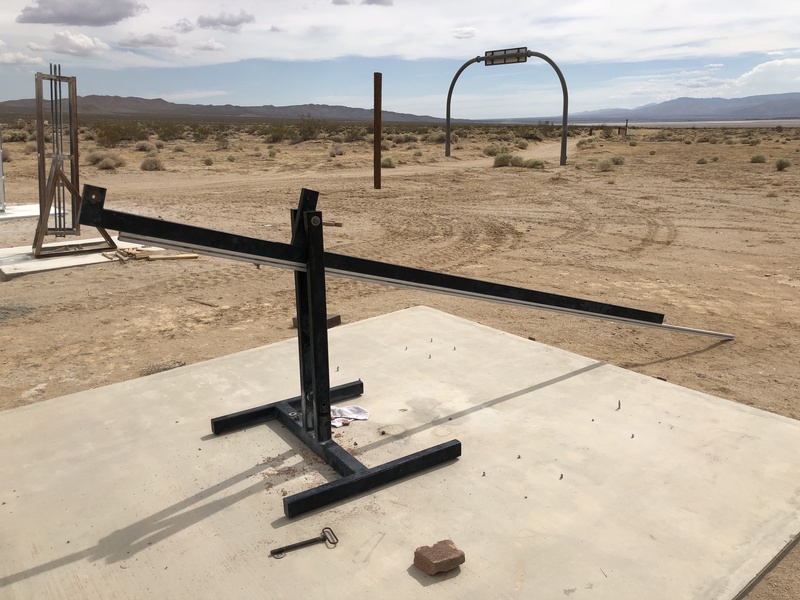 Richard Garcia’s project having two successful static firings gave him confidence to try to mount and fly the third sugar motor. 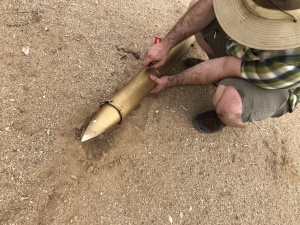 After having some initial integration problems and a rail button coming off, he was able to get his golden rocket ready for a launch on the rail launcher. The rail launcher at the MTA is a great asset to the society. 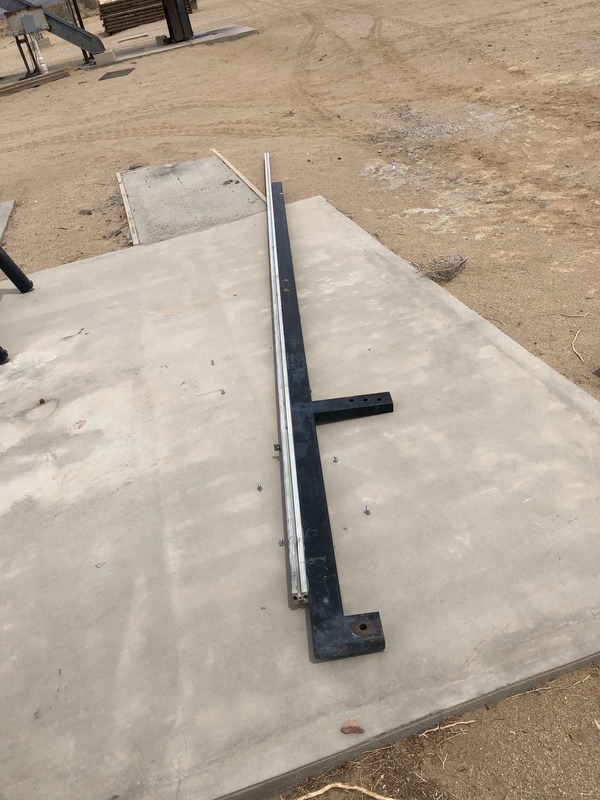 It has been used on several projects with good success, but it is a very heavy and sturdy device that requires two or three people to assemble and make ready. 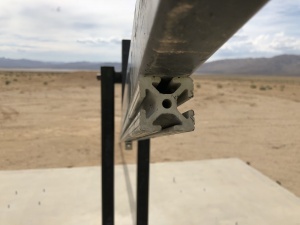 Also, the pin system that connects the rail to the stand fits very snugly and sometimes requires a lot of elbow grease and persuasion (perhaps with a rubber mallet) to get the right alignment of the holes. Despite the high heat, we managed to get things ready for Richard’s flight. Richard checks the manual for the telemetry package that he armed for flight. Richard’s flight was on one hand a little underwhelming as his sugar motor did not produce a great deal of impulse, but it did manage to propel itself up and get clear of the launch rail before neatly turning back to the ground in a low-speed, but very steady and stable flight. 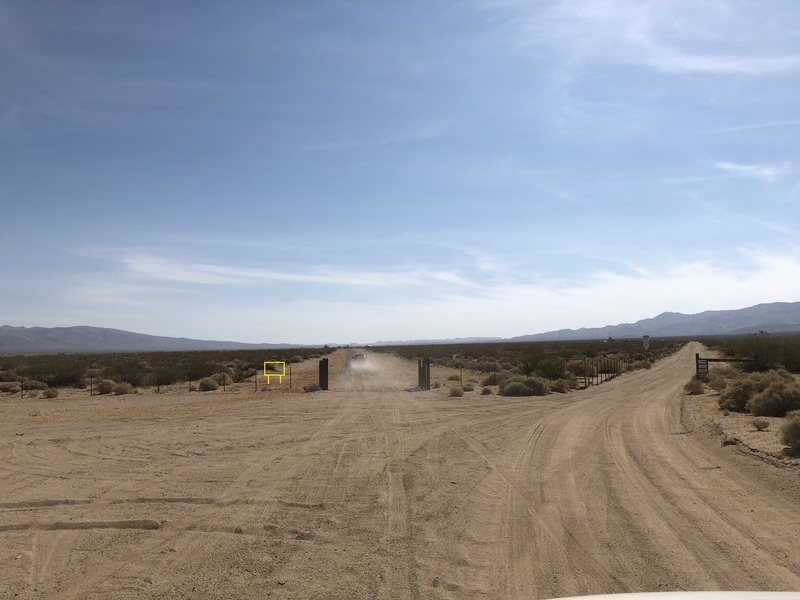 Although his rocket only made it 50 feet downrange, it can be seen in the flight video that his rocket was stable throughout the whole low speed which is a testament to Richard’s good construction of a very aerodynamic and well-balanced vehicle. 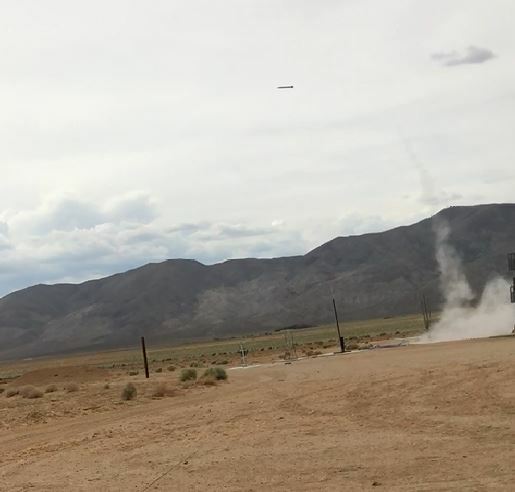 After a perfect arc at its low apogee, the rocket turned back to the ground and landed almost perfectly on its nose. Despite the rough landing, the nosecone wasn’t damaged and many parts of the vehicle were similarly undamaged. Richard safes his payload system as he inspects the recovered rocket. Richard will be working on increasing the impulse from his motor, but he can be very confident in his vehicle design. With a little rework on some of the parts, I think he should have a very impressive flight at the next launch event. 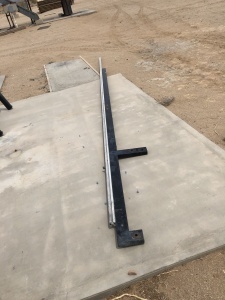 Osvaldo has put a lot of work into the horizontal thrust stand that I started. To be able to static fire an alpha rocket to measure the impulse, we have to accomplish two more things. The first is to get better mechanical support for an RRS standard alpha to prevent sideways motions or “wagging” during firing. 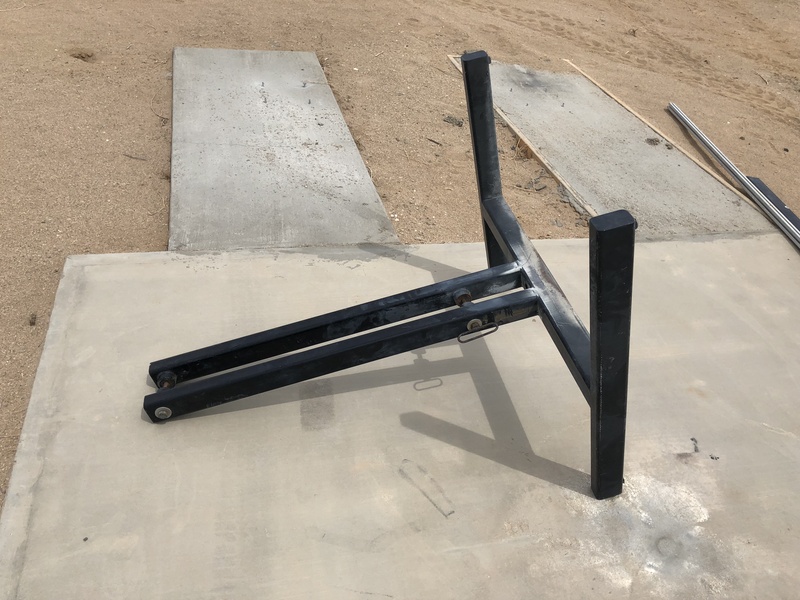 The stout, welded frame of the horizontal thrust stand fits just fine to the concrete slab foundation and is very secure, but the 3-foot length of an alpha could create quite a wicked angular load on the load cell. After Osvaldo and I had discussed a few design concepts, Osvaldo brought his design to the MTA. 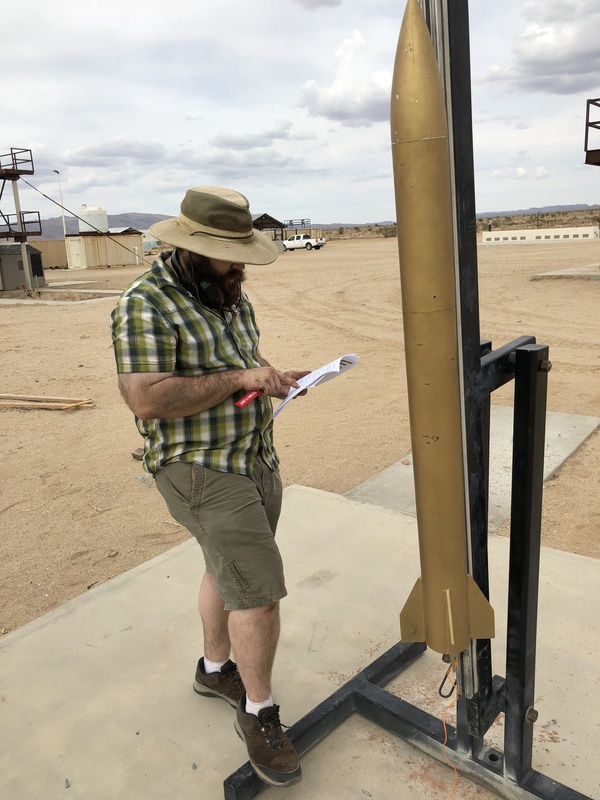 Given the time constraints of the launch events that came before and the stifling heat, we had no time to attempt a fit check of an alpha rocket in the thrust stand. The complete assembly will have to be fit checked at the next event. Osvaldo had also noticed that when the long alpha rocket is put into this short stand, the rocket doesn’t align very well with the beam. Some minor adjustments might be necessary to make sure the thrust vector is properly aligned with the axis through the load cell. 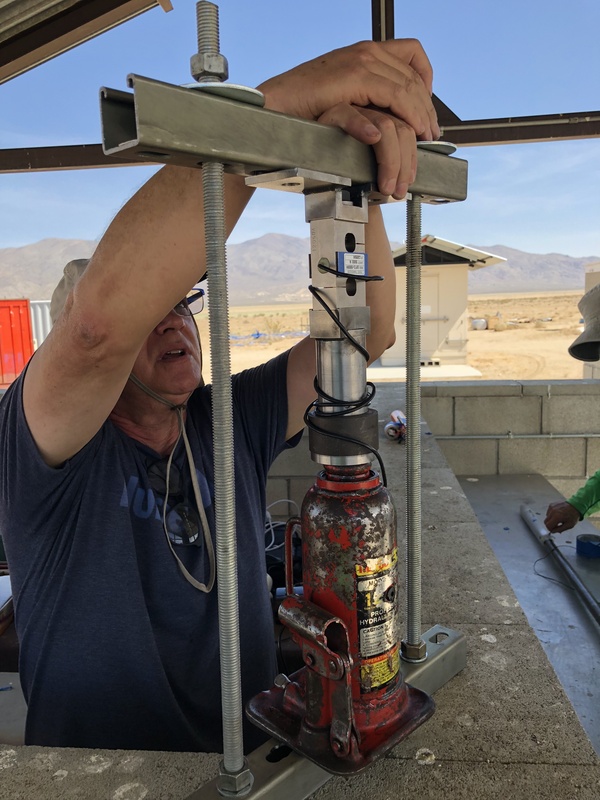 The second thing is to try to calibrate the load cell to make sure the S-type load cell is still reasonably within its original factory calibration. Osvaldo brought in a home-built frame with a hydraulic jack and pressure gauge which can reasonably approximate a force by the pressure and piston area relationship. 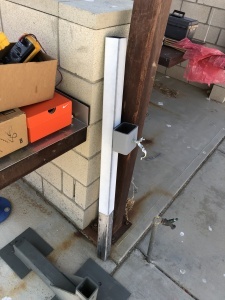 We didn’t have time to try this setup, but this device can be demonstrated at home if Osvaldo has time before the August 10th meeting. 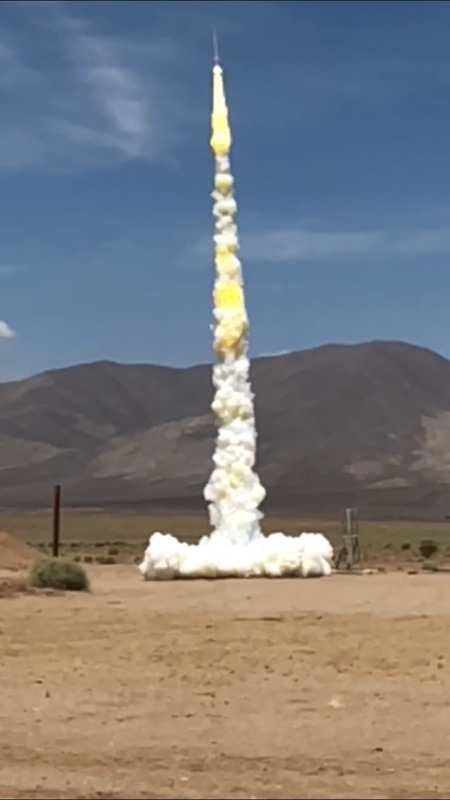 The horizontal thrust stand was not ready for the 2018-07-21 launch event due to a lack of cabling and a hardy computer to manage the data acquisition. 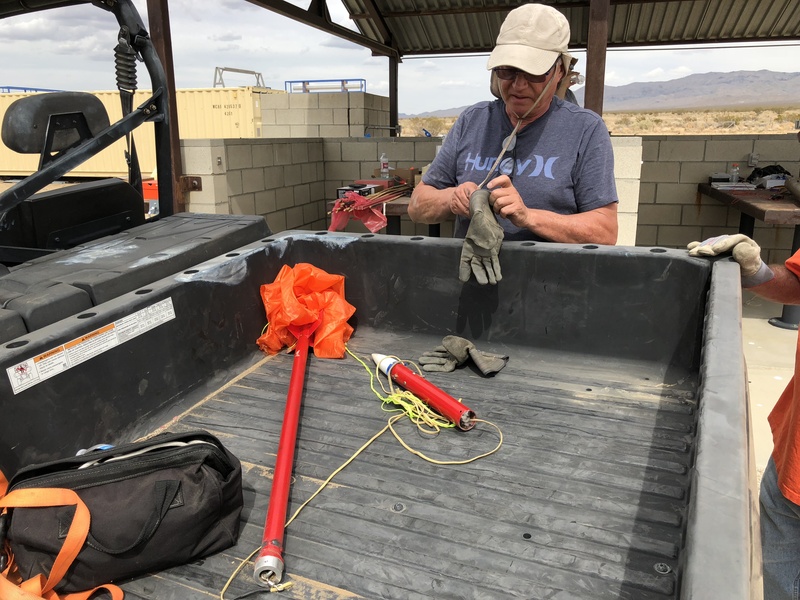 Many of us are reluctant to bring our personal laptops to run the data acquisition in the abrasive sandy dry lake environment at the MTA. Chris Lujan at the July meeting talked about using a simple Arduino Raspberry Pi computer as a low-cost alternative to gathering and processing the data. Hopefully, the RRS will get a simple device for this purpose and have it programmed to take data from the load cell as we conduct our hot-fires from this horizontal thrust stand. There still is a lot of work to do in getting the horizontal thrust stand working. With more hard work, the RRS will have this project working soon, hopefully by the next launch event in the fall. We’ll post updates as this project advances. One final note on the event is that the RRS will be posting a few things on Instagram once the secretary (me) has time to get things started. The RRS is brand new to Instagram so we hope to expand our presence here to better show everyone what we do. At first, the RRS executive council will have access to post photos at the events we attend for the RRS. We hope this presence on Instagram will generate more excitement and participation at events with the RRS. The RRS will certainly discuss today’s launch event as a whole at the next meeting on Friday, August 10, 2018. There were a lot of great things we tried at the event, but there were also a lot of logistical things we can do better next time. 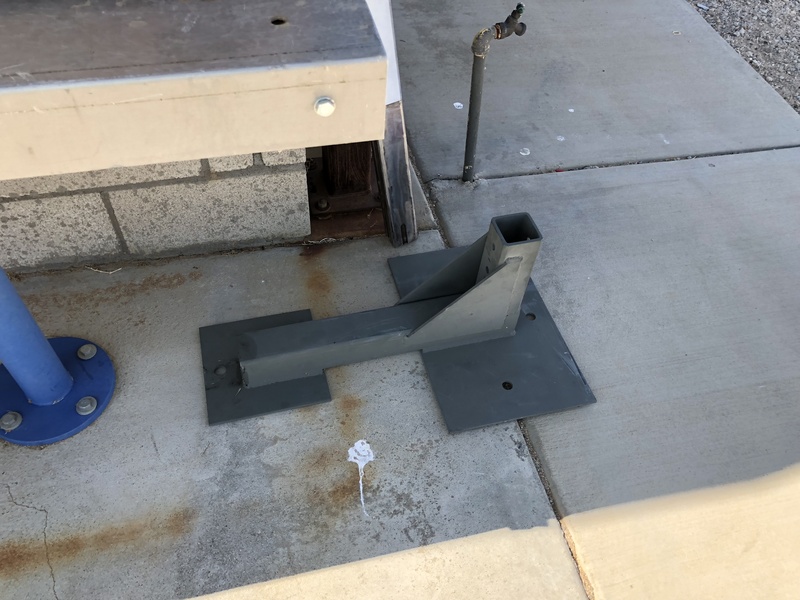 Also, it would be a good time to review some of the material improvements that we ought to make at the MTA to better handle the projects we expect in the near future. Please join us on August 10th!